Tired of walking into stores designed the same old way with the white walls and black counters, covered up in metal and mirrors? 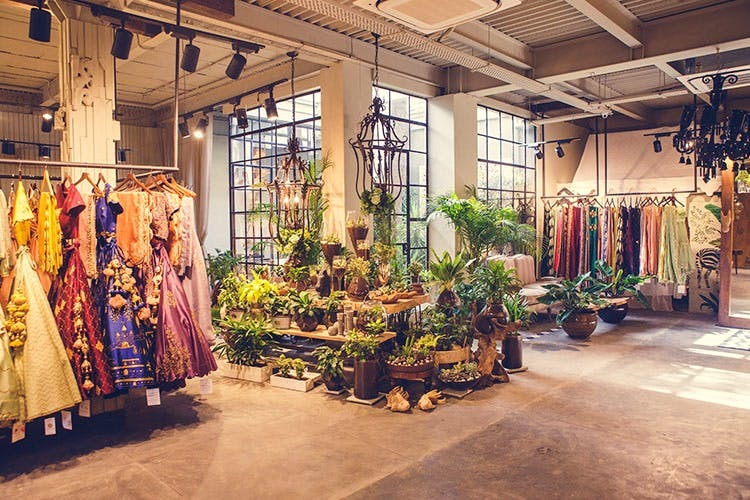 Try this one on for size… Designer Gazal Gupta’s new store in Mehrauli is Delhi’s first ‘ecochic’ store — it’s been put together using plants and recycled materials and even has two full sized trees growing through! With an aim to have plants and abundant greenery in her store, she collaborated with interior designer, Shabnam Singh, to bring these lush aesthetics to life. The store has a complete nursery inside and is arguably the first one to have such a concept. Remember the two trees we mentioned? The interiors and the decor has been worked around them, keeping their natural habitat untroubled. The rustic look is made up of recycled wood, old mirrors, and eco-friendly items that have been reconstructed and reused. Talking of Ghazal’s outfits, they have been heavily embroidered and comprise vibrant saris and lehngas. So, if you’re going shopping for that, might as well pick up a plant or two from the nursery! Shaadi shopping with plant shopping, now that’s really a first. There's not a lot we don't like about the place. It's definitely a bit on the pricier side, but being a designer boutique, we don't expect any different. You can actually buy the plants here since it's a nursery. Check in with the store staff for pricing.